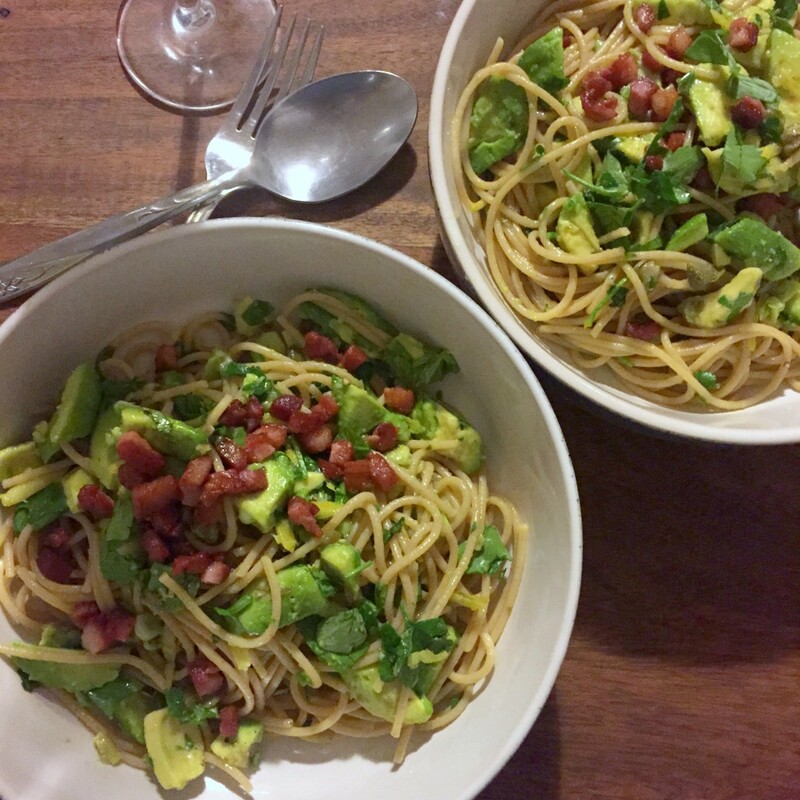 So I’m a bit addicted to this avocado and lemon zest spaghetti. Since I first tried it out in January I have made it at least once a week! As I mentioned here, I want to cook more new dishes this year from the great selection of cook books I have. 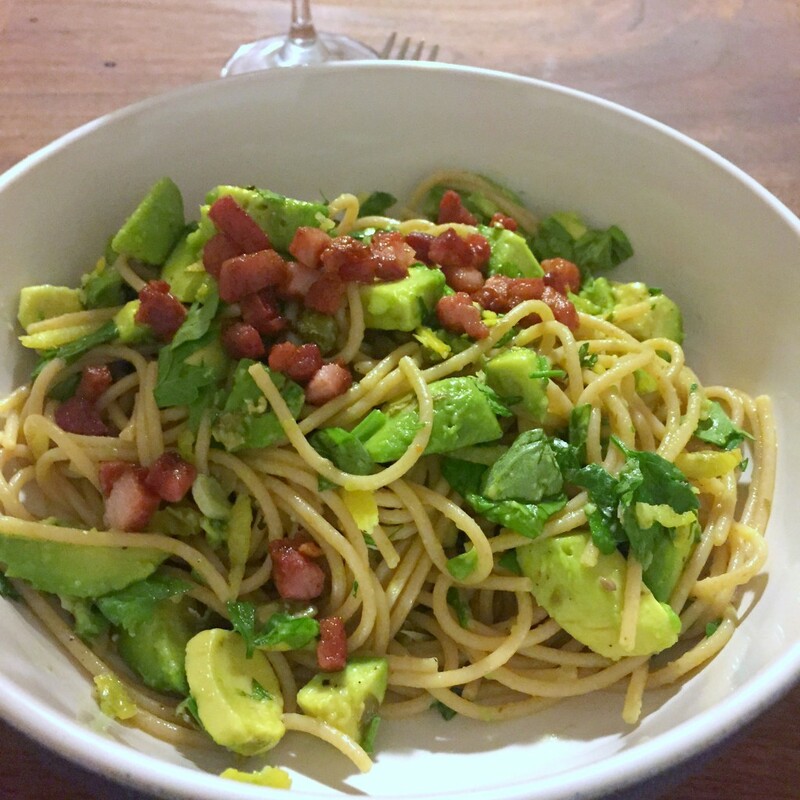 This avocado and lemon zest spaghetti was the first new dish I decided to make and I love it. The recipe comes from A Modern Way To Eat by Anna Jones. 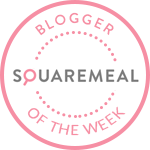 I love this recipe because it is the perfect mid-week dinner: super quick, easy and doesn’t make much mess. Oh, and I usually have all the ingredients already! Now before we start, I know that this cook book is vegetarian and as you can see I added pancetta. This is just my version of the recipe. My husband doesn’t really do dinner without meat so I adapted it so that we could enjoy it together – ahhhh. But, I think the pancetta is totally optional. I love it with or without. It adds a nice crispy texture to the mix and the saltiness pairs perfectly with the avocado. However, it is cheaper and healthier without so I often opt for that if hubby is out! But either way, the incredible smell from the lemon and herbs. Just so fresh. I mean look at it! Fill a pan with water and bring to the boil, add a good pinch of salt and splash of olive oil, then add the pasta and cook for 8–10 minutes, depending on how al dente you like it. On a low heat add some olive oil to a large frying pan and add the capers and garlic. Fry these gently until the garlic just starts to brown. At this point remove the pan from the heat and add the lemon zest. Get another frying pan onto a high heat and add the pancetta. Fry until a little crispy – I leave this to fry whilst I finish off the rest of the dish. Add the chopped herbs to the big frying pan. Use a knife to slice and cube the avocado and scoop out with a spoon into the pan. Stir to really combine all the flavours. It creates such a lovely fragrance! Drain the pasta and add it to the frying pan with a drizzle of olive oil. Taste and add salt, pepper and lemon juice as needed (I use the juice of a whole lemon because I just love lemon, add more or less to suit your taste). Give it a good mix. Portion up the pasta and top with the crispy, salty pancetta. You won’t believe how something so simple can taste so incredibly good. I also love this without the pancetta, just depends on my mood. 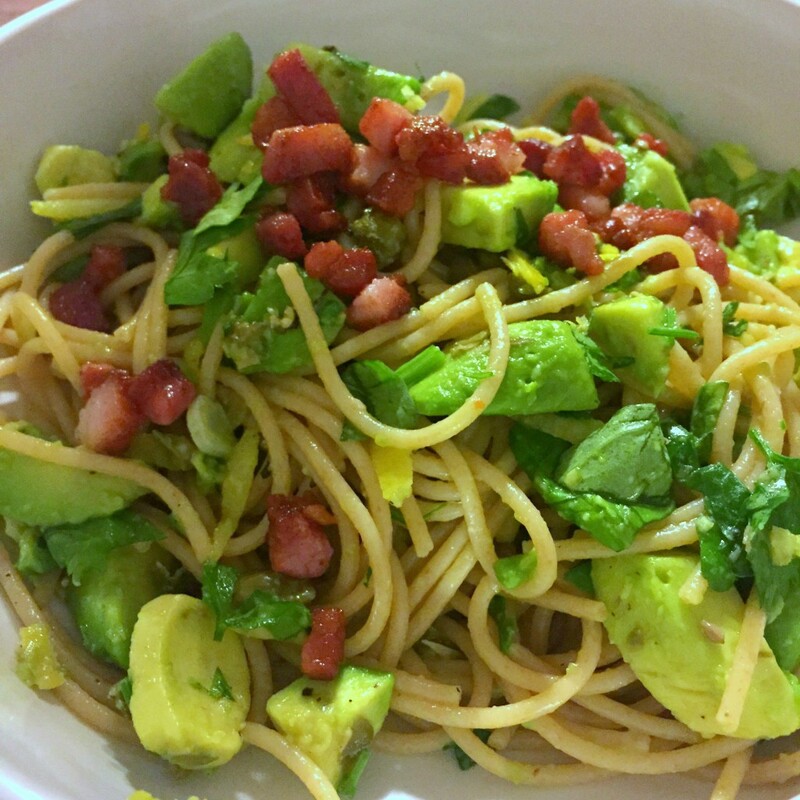 But seriously who knew avocado and lemon could taste so good on spaghetti! 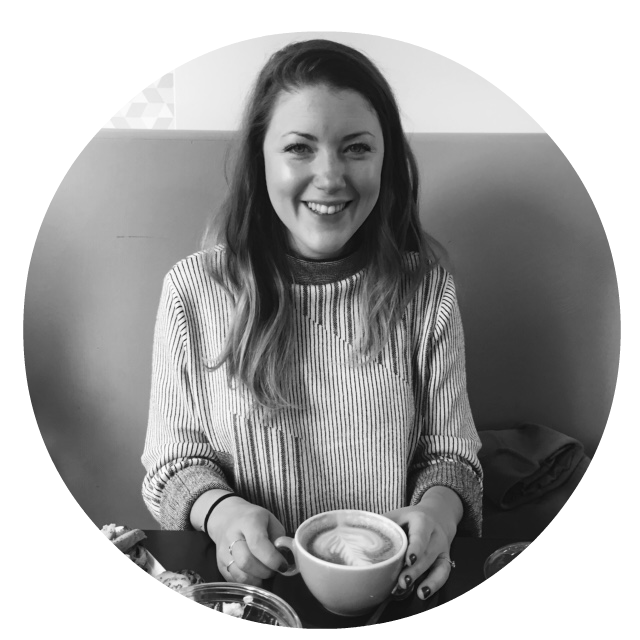 Follow me on Bloglovin, Instagram and Twitter for all things food! Looks so sunny… can one describe food as that?! Either way, it looks so fresh and delicious! Also chuckled at ‘husband doesn’t do dinner without meat’… Substitute husband for boyfriend and it’s the exact same in my house! Can totally describe food like that! Haha, oh yes. He doesn’t do veggie dinners! It’s so easy to make – you should definitely try it! It’s seriously tasty! Oh, I like the sound of salad and tomatoes! Thank you! It’s so tasty – hope you enjoy it!